How many times have you used the expression “When in Rome…” ex post, to explain away behavior that is out of character for you? Better yet, how many times have you used the expression ex ante in anticipation of behavior that is uncharacteristic for you? Perhaps this expression is most appropriate for Las Vegas, even more apropos than the oft repeated “What Happens in Vegas…Stays in Vegas”, which suffers form its shameful guilt ridden sub-text. So what are people availing themselves of, that they don’t partake in at home, surely it can’t be gambling, since the proliferation of casinos across that country have made this activity ubiquitous. I have my nominee, to use the current vernacular, Vegas is “Foodie Heaven” I’m not talking about the abundance of celebrity chefs, like Old Timer Wolfgang Puck or the newer, Food Channel creations like Emeril “Bam” Lagasse or everything tastes better when it char-grilled— Bobby Flay. I’m not even referring to Joel Robuchon’s eponymously named Three Star Michelin rated restaurant. I am referring to the humble buffet, as reinterpreted by Steve Wynn when he opened the Bellagio. When you say “Casino Buffet” to most people, they probably think, great, all the fried chicken and instant mashed potatoes with suspiciously opaque brown gravy that I can eat. Add a salad bar with lots and lots of iceberg lettuce, plus perhaps some canned olives with less taste than the tin can from which they were procured. For desert you could blindly choose any desert, as they all taste that same, as the only identifying taste is sweetness derived most likely from high fructose corn syrup. Yuck! 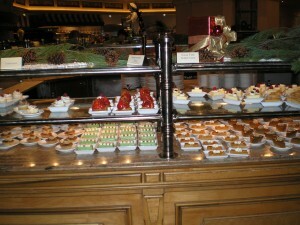 Steve Wynn changed the whole buffet scene in Vegas when he opened the upscale buffet at the Bellagio. More than twenty years later, this is still the buffet against which all other buffets in Vegas are measured. Many of the buffets in Vegas lay claim to being the Number One Buffet, don’t believe them, Bellagio is the one with the title, with the new buffet at Wynn a close second. So what makes the buffet at the Bellagio so great, the short answer is: Everything. Okay, the room is nothing special, but true foodies don’t care about ambiance, they’re there for the food, period. Let’s start with the breakfast buffet, first off, they get the two most neglected breakfast buffet items right, the coffee is full bodied and strong, but not overpowering and burnt, sorry Starbucks Lovers. The orange juice tastes fresh squeezed, but is not, it tastes every bit as good as Natalie’s Orange Juice , for the Natalie’s fans out there, of which I include myself. If I had to pick one buffet item that distinguishes the Bellagio buffet from the rest, it would be the Eggs Benedict. Eggs Benedict at other buffets more closely resembles an open face egg McMuffin with a bland yellowish sauce, with the egg most assuredly hard boiled. Somehow the chefs, I don’t think chef overstates the case, manage to keep the eggs seemingly freshly poached and the Hollandaise sauce hits all the correct lemony-butter notes. All the other expected breakfast items are here, usually with some special extras, like omelets cooked to order with the option of crabmeat and shrimp. I feel compelled to mention the wonderful chocolate croissants which have a buttery flaky outside surrounding a strong bitter-sweet chocolate filling. The two other contenders for best breakfast buffet in Vegas are Paris and Wynn. The Paris buffet, once thought to give the Bellagio some competition, has been on the decline since they were bought out by Harrahs. Additionally, the Paris buffet fails on the two most neglected breakfast items: first the orange juice is clearly from concentrate, and second the coffee is weak, really weak, and I thought the French were known for their strong coffee. What distinguishes the Paris breakfast buffet is the large assortment of sausages, imported cheeses and smoked fish, plus made to order fruit crepes. The lunch and dinner buffets, particularly the weekend dinner buffets are what really sets Belllagio apart from the competition. First off, just as they’ve mastered the preparation of Eggs Benedict such that the eggs remained poached and not hard boiled, they are similarly skilled in the preparation of fish, and they usually have three or four choices, beyond the ubiquitous salmon. The Chilean Sea Bass they serve on weekends is among the best I’ve had anywhere. The only two items I have some quibble with are the rack of lamb they serve on weekends is always well-done, if you want great medium-rare rack of lamb, you have to head over to Wynn, and the King Crab Legs are chilled and pre-split, which tends to dry-out the meat. My preferred venue for crab legs in Vegas is the Gold Coast, an under-rated value buffet. The Gold Coast serves steaming hot snow crab legs, which have slightly sweeter meat than king crab legs. The Oysters Rockefeller, at Gold Coast are also exceptional, unfortunately it is only available Friday night, seafood night. everything you try will tempt you to have just a little more. The chocolate cake actually tastes like good quality chocolate, not some tasteless industrial cake served at most of the other buffets. The carrot cake is another favorite. Fortunately, all the servings are small, to encourage the sampling of several desserts. While on the subject of desserts I should mention the only two other buffets that warrant special attention. First, the fruit crepes at Paris. Even though I’m a bit weary of recommending items at Paris, as Harrahs management seems to be systematically removing all the little extras that made this buffet so special in the past, such as large bowls of fresh raspberries, smoked fish, and grilled asparagus. The made to order blueberry crepe with raspberry sauce, a dollop of whipped cream, sprinkled with sugar-cinnamon and just of touch of ground walnuts is too delicious for words. Suffice it to say, if you offer a taste to others at your table, you’ll be heading back to the crepe station, as your plate will return empty. The other dessert worthy of special mention is the bread pudding at the Golden Nugget. The recipe is actually Steve Wynn’s mother’s recipe, a hold-over from when he owned the casino. In addition to the egg-custard and cinnamon flavor, I’m convinced there is a secret special ingredient that acts directly on the “bread-pudding” neural pathway in the brain that makes this desert both delicious and highly addictive. How addictive? Your first thoughts the following morning will be “How soon can I get some more Golden Nugget Bread Pudding” Warning, don’t try to out-smart this urge by having the bread pudding the night before you leave Las Vegas, it is too embarrassing to explain how you missed a flight because you had to have another taste of the bread pudding at the Golden Nugget. It’s that good! While the giant leap in the quality of Vegas Buffets is the single largest change to occur in the last twenty years, other changes are apparent. Prime Rib and Chilled Shrimp which were the markers of an upscale buffet in days of yore have been replaced by sushi as markers of “class”. Even the downscale Fremont buffet serves sushi at their buffet, even if it is of the industrial pre-made variety. Almost all Vegas buffets have added some form of live cooking stations to their line up, thereby closing the gap between buffet and mid-priced restaurant. salad, which goes well with the buffet’s barbecue specialties. 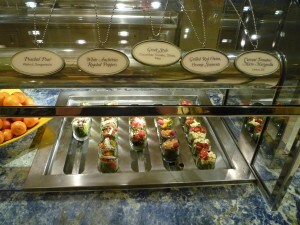 The Wynn buffet offers pre-made salads with an exotic flair. Such as Currant Tomatoes with Micro Mozzarella and Lemon Oil; White Anchovies and Roasted Peppers; Poached Pear with Walnuts and Gorgonzola; Grilled Red Onion with Orange Segments; Greek Salad with Feta, olives, cucumber and tomatoes. I would be remiss if I didn’t mention the wonderful Tuna Nicoise salad at the Bellagio buffet, with it’s lightly seared Ahi Tuna. Mirage and Rio have added oriental noodle soup stations, where the soup is prepared to order, with your choice of noodles, meat filled dumplings, BBQ Pork, among other items. Would it come as a surprise to you, if I told you a few of the buffets in Vegas are over-rated? In a town over-flowing with magazine and newspaper articles written by professional flacks and where the term shill is omnipresent, but never mentioned. The most over-rated buffet in Vegas, has to be the one at the Rio. It probably has the largest selection of items, but clearly it is a triumph of quantity over quality. There are no dishes here that are worthy of any self respecting foodie, but people seemed dazzled by the variety. The only positive note is that they have improved the buffet from the truly dismal quality it was several years ago. The buffet also tends to be expensive, especially in relation to the quality. The recommendation is to skip the Rio and go across the street to the Gold Coast, a buffet well known to locals, but seemingly ignored by visitors. While we’re in the neighborhood, The Palms is another buffet well worth passing-up. The Spice Market buffet is over-rated in the sense that it claims to be the #1 Buffet in Vegas, an over reach, but still a good buffet. If you have a hankering for middle eastern food this is the buffet to go to, with very good Hummus and Baba Ghannouj. Unfortunately the Pita Bread ranges from ice cold to room temperature. They tried to copy the Paris Buffet with made to order fruit crepes, a true disaster. The fruit is a sort of canned pie filling that is so gelatinously thick you could easily repair a hole in your roof with this stuff. There are also a few under-rated buffets that don’t seem to get the attention they deserve. The most under-rated buffet is the relatively new one at Treasure Island or TI, perhaps this is partly due to the fact the Treasure Island used to be home to one of the worst buffets in Vegas, and memories are long. The feature items here are the barbeque, they have a large smoker to slowly smoke the brisket and ribs, the best at any buffet in town. 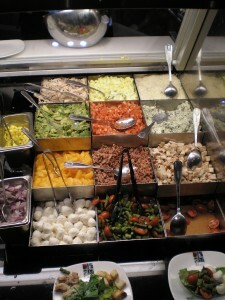 The salads and pastas are made to order at their respective stations, and are quite good. I recommend the gnocchi in a pink sauce and the BBQ Cobb salad. They also have sushi, just like most of the strip buffets, unfortunately it is pre-made off-site, what I call industrial sushi. So, if you like supermarket sushi, you’re in luck. 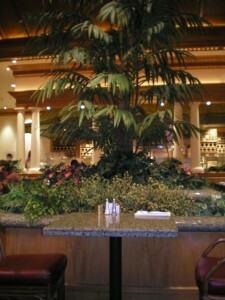 The other Vegas buffet that is often overlooked is the Bay Side Buffet at Mandalay Bay, perhaps because it is literally at the most southern end of the Strip. The room is one of the prettiest in Vegas, only Wynn’s buffet has a nicer room, if these things matter to you. One of the few buffets where fish dishes are worth a second look. The oven roasted wood-plank salmon fillet is a must try. As a closing comment on Vegas buffets, I feel compelled to mention price, and more importantly, value. The best buffet values are found at the high and lower price points. While the Bellagio may cost a few more dollars than other strip buffets, the quality of the food make it a wise value choice. On the lower price end, I feel the Gold Coast is a real value particularly when compared to the neighboring over-priced Rio buffet. When in Vegas—do what the locals do, enjoy a buffet.